My friend Harry* doesn’t have much in common with Graham, who I worked with many years ago. They were born and raised in different countries, and had vastly different upbringings. Harry likes ballroom dancing, seafood and wine; Graham prefers Thai, beer and Bay Area thrash. But they do both adore their partners and children and they have two other interesting things in common. Of all the men I know, Harry and Graham are the two who have shown the most ongoing interest in discussing the births of their children with me when we meet socially. And I don’t just mean the 3am ‘wooo hooo’ text sent to everyone in your contact list announcing that you’ve become a dad. They have both wanted to discuss, process, analyse and ask questions about their and their partner’s birth experiences on multiple occasions, often going over the same ground from different angles. The other thing they have in common? Both of their partners had traumatic birth experiences. I shan’t go into the full details but, between them, Harry and Graham have witnessed the women they love going through one episiotomy, one vacuum extraction, two post-partum haemorrhages, one trip to the operating theatre and what they both felt was substandard care and attention to their partners. 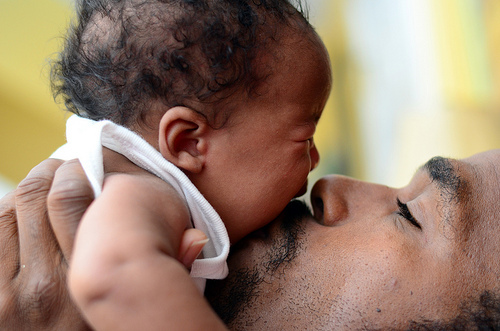 It is in honour of Harry, Graham and all the fathers (and, yes, let’s please not forget co-mothers) like them that I want to share the findings of two recent studies which both highlight elements of the experiences of dads at birth. Although both of these focus on complicated births, it’s important to remember that birth doesn’t have to be complicated or traumatic for the woman in order for her partner to be negatively affected by the experience. 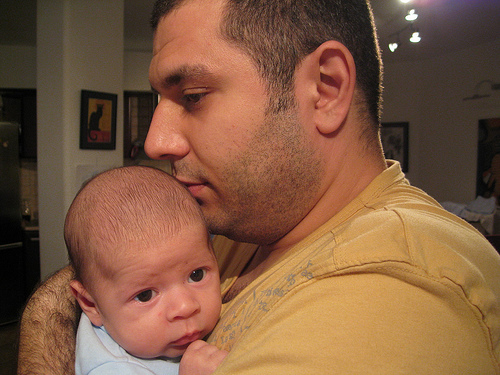 The themes that arose in the experiences of the dads who were interviewed by Zwedberg et al (2015) are also found more widely in another study, this time a meta-ethnographic synthesis of fathers’ experiences of complicated births that are potentially traumatic, which was undertaken by Elmir and Schmied (2015). They identified four major themes: ‘the unfolding crisis’, ‘stripped of my role: powerless and helpless’, ‘craving information’ and ‘scarring the relationship’. Harry talks about this a lot. He left the room to make a phone call after his baby was born and while the midwife was delivering the placenta and returned to find the room full of people because his wife was bleeding more than normal. He couldn’t get through the crowds to reach her and was twice pushed out of the way by staff. Nobody explained what was happening to him until several minutes after she was rushed out to theatre on the delivery bed. Harry thought she was dying. The implications and recommendations from both papers are similar. Women’s partners need information, support and, in some cases, an opportunity to participate. In the longer term, if my personal experience is anything to go by, they need the chance to talk their experiences through, often more than once. This is hard in a system where caregivers barely have time to care for the women who are giving birth, and it’s also hard in cultures where men are not encouraged or allowed to display or talk about their feelings. It does, as Elmir and Schmied (2015) conclude, raise some interesting questions, and these deserve to be debated, but for today all I really want to say is this: if you know a man like Harry or Graham, please feel free to share this with him so he knows it’s OK and normal to feel this way. Thanks. * names changed to protect confidentiality, of course. Thank you for this important perspective!